Here's another great recipe for the New Depression. And it's healthy, too. Cabbage is one of those veggies you are supposed to eat more of. It contains sulforaphane, a chemical said to boost cancer-fighting enzymes. Like most soups, it's open to individual interpretations. Soup broth, unlike many liquids, is immediately absorbed into your body. Rinse the shanks and add to a dutch oven or soup pot. Insert one clove into an onion section and add the roughly-cut onions. Cover with water, at least 8 cups. If you have chicken broth on hand, sub for some of the water. Bring just to a boil, reduce heat and simmer for 2-4 hours. Carefully remove the ham shanks to a bowl. When cool, remove as much meat as possible and reserve for the soup. Strain the broth. This can be done one day ahead--just refrigerate the broth until ready to use. NOTE: This is the stock one should use for bean, lentil, pea soups. Bring broth to a simmer. Add diced onion, caraway, stewed tomatoes, carrots, potatoes. 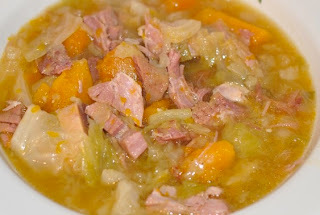 Just before the potatoes are tender, add the chopped cabbage and reserved ham. Allow to simmer for about 20 minutes until cabbage is just tender. Taste and season accordingly. Ladle into bowls and serve with a nice rye or pumpernickel bread. Like most soups, it's even better the next day. NOTE: Don't be afraid to substitute turnips for the potatoes, or a combo. If you don't like caraway, a bit of crushed cumin would work well, too. I've had this with neither, and it's still good. 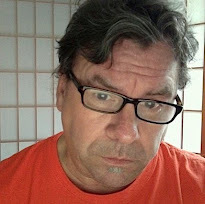 I have come here from Mr. JOHN GUZLOWSKI's blog. I have read some of your posts and would like to revisit for more reading. Yes,Mr. 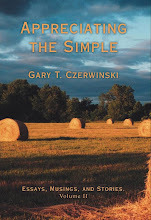 Guzlowski is certainly an interesting person. Here in the States we are currently enjoying Michael Woods' series about India on our Public Broadcasting Network. I am currently finishing up my first novel which has been fun. What hasn't been fun is the two feet of snow we have. And it just keeps sifting . . .
No cabbage soup here today, Gar; can't stand the smell of the stuff. I did, however, make my MIL's famous chicken soup. I couldn't find orzo in our lousy grocery store so I'm using bow ties instead. Yum, yum. If it ever stops snowing, I'm coming down for the rest of my jewelry.